Fukuhara Sake Liquor Store (ふくはら酒店) is a great liquor store located in Naka-Okachimachi. It has a great collections of Sake from all over Japan. Not only Sake, but also it has all kinds of liquors such as Umeshu, craft beer, Shochu and wine including wines and craft beer from all over the world. It has also tasting Sake for several brands of Sake. Close on holidays and 2nd 4th Saturday. Tasting: 200 yen for 60cc. 1. use JR Yamanote Line to Okachimachi. Fukuhara Saketen is over 95 years old liquor shop located in Okachimachi, Tokyo. 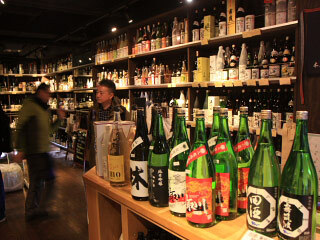 It has great Sake collections from all over Japan. Also, wins and craft beers from Japan and worlds, Shochu, Umeshu, fruits liquor and other Sake.